Dear U.S. Friends, we are in the midst of an historical and epic moment in time. The Presidential Election was a massive, national, high-stakes competition. And like all competitions, there are Winners and Losers. It’s worth taking a moment here to remember that in healthy relationships between two people who know how to relate to each other as adults most of the time, Winning and Losing is actively avoided in favor of negotiation, compromise, and agreement. Why? Because Win-Lose solutions put one side in the Power Position—which is alienating and toxic to human relationships when that power is misused or abused. Over the past 10 years I’ve had the joy and honor of watching my son play in 100s of soccer games. There have been exhilarating victories, and devastating defeats. Sometimes his team trounced the opposing team with painful, punishing scores like 8-0. In soccer—that’s a blowout. As the winning team, we were jubilant. Lots of jumping, hugging, smiling—pure and prideful glee. Other times we were the Losers. And it was painful. You’ve seen that look that athletes get—stunned—staring out at nothing in particular. Or when they hide their face, or cover their entire head, with a towel. And sob. I couldn’t help but feel empathy for the other team’s pain, even in the midst of the joy of winning. And here’s where we are as a nation: One side feels validated, gleeful, and hopeful. The other side—stunned, fearful, and mourning. The other side was shell-shocked, traumatized, confused, and disbelieving. Some are in an existential crisis, wondering Where is God? Their spiritual journey has been initiated by an unwelcome invitation to powerlessness and letting go of hopes and dreams—at least in the short-term. Over the past week, I’ve met with partners whose responses to the election have run the gamut. Some are traumatized because the President-Elect reminds them of their bullying, sexually abusive father who gas-lighted them and lied to others to cover up. Others are pleasantly surprised, and look forward to seeing changes that are important to them. Others are somewhere in between, and not impacted much at all. And when they’re all sitting in the same room—it’s challenging. For the Winners, enjoy the victory! Find and spend time with like-minded people who can truly and unabashedly share your joy. For everyone else, allow yourself the full range of emotions. For some, the election has felt like a death, and they are grieving. In her book On Death & Dying, Elisabeth Kübler-Ross outlined the 5 stages of grief: denial, anger, bargaining, depression, and acceptance. No matter what you’re feeling—pain, fear, anger, or shame—honor your feelings and do whatever you need to do to express them. Journal, vent to a friend, sponsor or therapist, draw, exercise, or go to the thrift store and buy some old, cracked dishes to smash. Regardless of which side you’re on, take as long as you need to feel whatever you feel. Every person has a right to think and believe as they do. Many people are grappling with the reality that a good portion of their extended network of neighbors, friends, and family see the world in a very different way than they do. If possible, find ways to hear differing views while keeping an “I’m okay, you’re okay” perspective. Easy to say—difficult to do. Here’s where the wisdom of the 12-step community’s no cross-talk guideline can help. Allow others to express their thoughts and feelings without getting into awfulizing, futurizing, becoming contemptuous, or getting bogged down in political policy or partisan debates. In your family or other groups where there are differing opinions, give each person 5-10 minutes of uninterrupted time to say what they need to say without feedback, cross-talk, or response of any kind. I’ve been doing this with my in-person groups over the past week, and it has been honoring and healing for everyone. 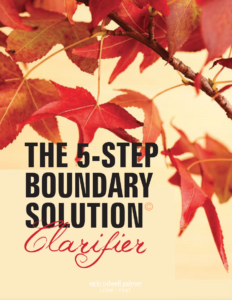 These boundaries create safety and allow differing views to be voiced and heard. Winners, please stay mindful that underneath the anger of protests, there is deep pain. As long as others aren’t violating your boundaries, let them have their feelings. In the Winning position, it can be difficult to stay in humility and to keep yourself from going one-up and feeling superior and powerful over the Losers. One of the worst things about going one-up on other people is how good it feels. Don’t go there. You’ve been in their shoes in the past and you will be there again. Everyone else, be mindful of the temptation to do what Pia Mellody calls “offending from the victim position.” You may perceive yourself as a victim—and feeling like a victim hurts. Remind yourself that you’re not a victim. And avoid the temptation to elevate yourself out and up from the one-down position by going one-up—or feeling superior to—the Winners. It’s a short-term fix that can feel good for a moment, but ultimately doesn’t work. And for all of you on either side of the fence who want to take it to the next level, consider praying for the other side. Praying for your so-called “enemies” is one of the surest ways to keep you humble. And it will super-charge your spirituality. There is no escaping that everything is impermanent and subject to change. Today’s Winners will be tomorrows Losers and vice versa. Keeping impermanence in mind will bring you peace, keep you in humility, and give you hope. After acknowledging what is real and feeling your feelings, you may hear a quiet—or LOUD—voice urging you to take action of some kind. Don’t ignore it, especially if you’re feeling angry and hopeless. Even small actions like prayer, writing a letter, calling your elected officials, or joining a group of like-minded people with similar views and goals helps. In times of personal powerlessness, it’s important to know where you have power and to take action around anything that is in your power to change. You’ll feel better when you do. In my work as a therapist, I’ve had an intensely intimate front-row seat to the trauma experienced by so many in their family of origin and in their adult lives. In these personal moments of processing the pain, shame, and grief of the past, politics, gender identity, religion, sexual orientation, social status, and race dissolve. It’s not that these things don’t count—they do—but they’re eclipsed by the shared, universal and heroic journey of being human. What shines through is courage, resilience, and hope. We are all more alike than we are different. In closing, I offer a prayer of Lovingkindness. Use it if it helps.